This paper was for the first time presented as a keynote presentation at the plenary session of the FIG Working Week 2004 in Athens, Greece 25 May 2004. The 21st century is the century of the cities and of urbanisation (Hall/Pfeiffer 2001). According to The State of World Population 2001, an actual report from the United Nations Population Fund, roughly 2.8 billion people live already in cities and by 2015, that number will have risen to 3.9 billion. The total population is increasing by 280.000 people per day. Nearly three-quarters of them will be inhabitants of the developing world. While in developed countries urbanisation has mainly taken place in the second half of the 19th century, developing countries are in the middle of their urban growth now. In Europe already 76 % of the population live in cities. Urbanisation has come to stand still and we can notice a process of dis-urbanisation and sub-urbanisation caused by a high rate of motorisation combined with prosperity and the development of traffic and communication infrastructure. Compared to this in the developing countries, the urbanisation is increasing rapidly and will continue during the next decades. For the first time in 2007 more people live in cities than in the rural areas. The highest growth will occur mainly in the cities of Asia and Africa, that are now more than two-third rural, will be half urban by 2025. Never before urban population has expanded so fast because of the progress in agriculture, science of nutrition and medicine. For example Dar es Salam, Tanzania, has a growth rate of 6% per year, which leads to a doubling of population every 13 years. A high birthrate combined with an increasing migration from the rural areas that is reinforced by the so called “push-factors” (unemployment, low standards of housing and infrastructure, lack of educational facilities) and “pull-factors” (economical opportunities, attractive jobs, better education, modern lifestyle) lead to the very dynamic growth process. Most of this growth is taking place in the poor quarters of the cities. One can imagine the challenges to manage cities in a sustainable manner when their population doubles every 13 years. The number of megacities, which have 10 million or more residents, is increasing worldwide: 1950: 4, 1980: 28, 2002: 39, 2015: 59. Two third of them are situated in developing countries, especially in South-East-Asia. In 2002 already 394 million people live in megacities, 246 million of them in developing countries, more than 215 million in Asia. In the year 2015 the total population of megacities worldwide will be about 604 million and the further rate of growth will be high, as the development of Mexico City, São Paulo, Seoul, Bombay, Jakarta and Teheran shows which population has tripled between 1970-2000. According to the estimation of the UN concerning the number of megacities in 2015, Bombay (22.6 mill. inhabitants), Dhaka (22.8), Sao Paulo (21.2), Delhi (20.9) and Mexico City (20.4) will be five of the worldwide six biggest megacities each with much more than 20 million inhabitants. 100 years ago London (6.5) has been the greatest city (one million more inhabitants than New York), today it is a shrinking town. The rapid process of urbanisation and the growing number of the megacities, cause a lot of different ecological, economical and social problems and risks. This impacts cause challenges for urban policies and urban planning strategies to manage the development in a sustainable way, when the population in some cities doubles every 10 to 15 years. The reason that the agglomeration and metropolitan areas as well as and megacities come into the international focus of policy and science are their serious impacts on the global environment like the enormous land consumption, air pollution, water scarcity, poverty, social segregation and vulnerability. As the numerous national and international conferences on urbanisation and megacities show, there is an obvious need for more and better urban development strategies, long term land policy and forceful urban management. Density: Megacities show the highest density of inhabitants, industrial assets and production, social and technical infrastructure. Metropolitan areas and especially megacities become more and more the centres and nodal points of the global economy. With their important role as centres of political and economic decisions they are promoters of national and international developments. Furthermore in this areas lots of highly qualified and “inexpensive” skilled labour are available and also the concentration of capital stock make them attractive for investments. Urban Agglomerations and megacities generate a lot of income and their local economies have an importance for their rural surroundings. It is no coincidence that in megacities worldwide have increasing part of the GND (e.g. Thailand: 20% of the population lives in Bangkok, but 70% of the GND). Dynamic: Megacities are characterised by highest dynamic in the fields of spatial and demographic growth, change of land use and consumption of land for settlement purposes, that mostly take place in absence of urban planning and on foreign plots. Also the formal and informal urban economic sectors are on a high dynamic level. The local, regional and global markets and the connection with the international economic circulation induce various increasing economic activities, so that megacities have the economic potentials and power to initiate economic growth also in the regions around the urban areas. Settlement, infrastructure and land tenure: In the most agglomerations and megacities urban planning and public infrastructure can guide the urban development in order to achieve a proper sustainable structure only very partially. The extension of cities is always in advance of urban development work and the provision of public facilities. Beside the “proper city”, which is in the focus of strictly conventional urban planning, all the other quarters and districts of the agglomeration and megacities grow up outside the law and without the benefits of urban planning. Especially the informal housing areas and in many times also illegal housing areas (squatters), that are build up by the migrants themselves lead to an extensive settlement structure. The illegality of those residential areas results mainly from the land tenure system. In many cases there is a lack of an efficient infrastructure for the public and private traffic, of proper garbage removal and also of sewage systems with wastewater purification. Most city-dwellers have no sanitation facilities and rainwater drainage systems are totally inadequate. This situation has serious consequences on the environment and public health. About 1.5 billion people live in slums and squatters. Socio-economic disparities: In megacities we can recognise a wide range of social standards and social fragmentation, social-cultural conflicts because of the different background of the immigrants and a great number of urban poor, which are bad provided with public facilities and infrastructure and their housing areas are often edged out by stronger economic purposes and land use. The development and extension of cities is accompanied with mounting urban poverty. Roughly a quarter of the population of the developing countries (1.3 billion people) are living in situations of absolute poverty on less than one dollar per day (UNDP 1997). A resident in a poorer housing area in Chicago has better living conditions than about 80 % of the megacity-dwellers in the developing countries. E.g. in Calcutta, Madras, Bombay and Delhi more than 50 % of the inhabitants are living in squatters. The growing socio-economic disparity within the megacities and the lack of social cohesion is the most serious explosive charge. 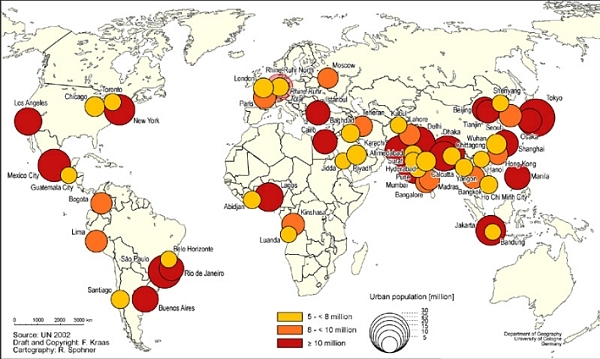 Risks and vulnerability: Considering the density and number of inhabitants and also the accelerated development megacities run highest risk in the cases of men made and natural disasters. Related to the population we have a high rate of consumption of natural resources especially land for new settlement areas, water and energy. The result is an ecological strain of the environment with serious pollution of the air, water and soil. Air pollution, mainly caused by traffic, traffic congestion and industrial production, in most cities of developing countries exceeds the environmental standards considerable. The annually losses of the world’s GND determined by air pollution is estimated between 0.5 and 2.5 %. Another considerable problem is the provision of the residents with clean drinking water. At many times the location of new squatters of rapid growing cities and agglomerations is not suitable according to a proper and safe urban development. The main reason is, that e.g. in the 1990’s, 60 to 70 % of urbanisation was unplanned, often in areas, which are adjacent to industrial zones, known to be highly seismic or flood prone. The accelerated and uncontrolled growth has contributed to the ecological transformation of the cities and their immediate surroundings (pressure on scarce and sealing increase the volume and speed of rainfall runoff that make many cities more vulnerable to flash floods). Furthermore other factors depending on the local circumstances contribute to the urban vulnerability: lowering or rising water table, rising sea level, earthquakes, storms and land slides. Through lack of choice the ongoing urbanisation forces more and more populations to settle on those disaster prone areas. Governance: One of the greatest challenges of agglomerations and megacities is their governability and one can recognise a crisis of urban government in this. The experiences show that the possibilities of traditional forms of centralised governance with top down strategies are restricted because of the extension, highly dynamic and highly complex interactions within the megacities and also with their surroundings. In the case of spatial planning, decentralisation and innovative planning processes with intensive participation are necessary. All in all agglomerations and megacities are not only risk areas of the global change, but they also provide opportunities. They are the engines of the economy and in many cases, they are also precursors of the urbanisation. The development of megacities and sustainability seems to be contrasts, that cannot go together at the same time. The high rates of land and energy consumption, the severe pollution of air, water and soil at present and the ongoing social fragmentation are not in compliance with the aims of a sustainable development. To cope this risks and challenges, considering the undamped growth, a spatial concept with a decentralized structure should be underlied that includes the urban and the surrounding rural areas. In the past, different models of sustainable development have been discussed, but there is no general admitted structure, that solves the risks of megacities. With view on megacities and agglomerations a regional settlement structure has to be designed which set up on the elements density, mixing of different land uses, polycentrality and capacity of public mass transport systems and public facilities. These are the prerequisites for achieving the ecological, social and economic targets of sustainability. The priority must be to slow down the urban growth. Therefore the living conditions and the economic basis in the rural areas must be strengthened, to prompt the inhabitants to stay there. Therefore it’s a vital necessity to promote new forms of cooperation between cities and between the cities and the villages at the regional level. To achieve a proper development of agglomerations and megacities a comprehensive plan is indispensable, that provides guidelines and principle goals for the urban development as well as for the development of the and that also provides the basis for construction immediate plans for economic and social development, area plans, district plans, detailed plans etc. In accordance with the sustainability, the integration and coordination of urban and rural areas with the central city should be a main principle. This requires a “multi-center”, “multi-axis” and “multi-level” urban spatial structure. For example the comprehensive plan of Shanghai (1999 – 2020) lines out five levels that refers to five scales. The urban system is composed of the Central City, New Cities, Central Towns and the Ordinary Towns and Central Villages. In case of the urban development of megacities a shift of urban policy and also of planning strategies is fundamental. This includes a legalisation and registration of informal settlements slums and squatters. Furthermore considerable social improvements and an access to schools and other educational institutions are necessary. Self-help housing improvements must be strengthened combined with the access to land to enhance the living condition, the identification with the quarter and at least the engagement for the (local) community. The final declaration of the Heads of State and Government and the official delegations from the countries attending the 2nd United Nations Conference on Human Settlements, Habitat 11, held in June 1996 in Istanbul, proclaimed the “right to adequate shelter for all” as one of the key themes of the conference. A billion people are today without a decent home and a hundred million are completely homeless. This gives a measure of the needs and the singular importance of the housing problem. Access to housing is now recognized as being central to social cohesion and a key factor for development. A long-term land use and land management strategies need reliable economic conditions and authoritative legal regulations. Therefore the reform of land tax must be discussed considering land policy, fiscal, social and ecological aspects. A sustainable urban development requires to prevent land fragmentation and also social fragmentation. Considering the rapid growth and that 60 to 70 % of the urbanisation are uncontrolled a comprehensive urban planning has to be developed and monitoring system must be established. Therefore the designation and mobilisation of building land is one of the long-term tasks to be addressed by the local authorities. To improve the housing situation at long-term, first the problems of land management and land use have to be solved. This requires legal instruments for more secure access to land and planning techniques for urban development and facilities. This frame must be provided at the national level by the State on the national level. If an adequate political, legal and institutional frame has been established, civil society can play an enabling role to implement the land policy and land administration. In practice the greatest challenge is not elaborating a comprehensive plan of the city or regional development, but providing sufficient urban land for housing and other purposes at a reasonable price and also the indispensable technical infrastructure. Urban land manager must be capable of evolving a coherent vision of the cities future and also mobilising private investment both for housing and for urban facilities and services. The provision of infrastructure for the purposes of transport, communications, energy, drinking water, sewage purification and sold waste treatment contribute the economic development, make the territorial areas more competitive and attractive and promote regional economic integration and social cohesion. But the developing countries cannot support their cities in this fundamental tasks, because they have to cope with severe, long-term budgetary problems. That’s why there will be a widening gap between the growing demand and the current provisioning of water and sanitation in the megacities with serious problems for the heath of the residents. The current financial gap is estimated to be US $ 16 billion a year. Especially public-private partnerships can bring efficiency gains and cost-effectiveness in the water sector. To influence city-dwe11ers' living conditions and economic development the public authorities have to be involved in producing and managing technical urban infrastructure facilities and services such as roads, transport, electricity, telecommunications, water, sanitation and waste treatment and also social facilities and services in the strategic fields of education and health. In megacities and agglomerations of the developing world there is considerable leeway to be made up and it will take a long time to achieve this with the 200 billion dollars invested each year by developing countries (4 % of their national product). E.g. only the needs of India have been estimated at 50 billion US $ per year. The main problem is to mobilise new external resources to finance gradual improvements of the urban infrastructure. Funds for new infrastructure are required and also for the maintenance and rehabilitation of existing infrastructure to avoid deficiencies. In this fields priorities must be given: Financing and management of existing facilities or investments in future facilities? The systematic extension of public transport systems into the surrounding is necessary to slow down the migration from the rural areas. A rail transit network with different speed and high capacities, passenger transit pivots and parking lots are important elements of an efficient mass public transport system. E.g. Shanghai has designed an urban transportation plan which consists of high speed rail lines, urban metro lines and urban light railways in order to limit the quantum of cars, motorcycles and powered bicycles. By means of high-tech, the research and development of intelligence transit systems should be forced. This is at the same time a policy reduce energy demand and also the emission of greenhouse gas. But in many cases efficient public mass transport systems are inevitable for these cities. With the ongoing growth of urban agglomerations and megacities, good governance within the cities become highly complex. One of the main problems in governing megacities and agglomerations is their big extension and high population. These cities have to co-ordinate their activities through local units. To shape policy in a local way it will be necessary to divide megacities and agglomerations in manageable territorial areas and to decentralise some responsibilities to the local actors and initiatives. At the same time it is important to ensure and to organise solidarity between all urban territorial areas and the rural surroundings and the central government. But there is still a need for city or even regional bodies responsible for city-wide or region-wide tasks like mass transit, waste disposal or structural planning. In many countries decentralisation of urban government is in progress and forced with heavy emphasis. The aim of this comprehensive movement is to improve urban living conditions by addressing needs as directly as possible and to enable city-dwellers to participate in city matters. It is a question of efficiency of administration and also of political strategies that involves reorganising the political authorities and administration responsibilities between the central and the local authorities. In the decentralising process, a balance must be found between internal socio-political concerns and the common development strategy of the megacity. But decentralisation by its own is not yet a guarantee for good governance. Decentralization requires also capacity building for an efficient local urban management. Inadequate mobilization of local resources is a major obstacle for managers in the performance of their tasks. Local tax levying capacities are poor owing to the lack of any organized collection and control system. Taxation methods are often discretionary and do not encourage taxpayers to comply. House and land tax legislation and tax of urban economic activities tend to be unproductive because they have not kept pace with economic and social development. This strategy is largely determined by the objectives and requirements of city-economic and budgetary balances, by the land use planning strategy, the financial policy, credit regulations, education and health policy, land and tax legislation. No foreign model of decentralisation is transferable and it is possible for countries to be enriched by other experiences and best practices, but they have to develop their own appropriate model. Megacities and urban agglomerations are complex and dynamic systems that reproduce the interactions between socio-economic and environmental processes at a local and global scale. Despite of their importance for economic growth, social well-being and sustainability of present and future generations, urban areas have not received the level of attention they require in the study of global environmental change. The increasing number and extent of recent natural and men made disasters illustrate the devastating consequences of some of the above mentioned trends and impacts. Global environmental change covers a diverse and broad range of issues. Megacities and urban agglomerations are certainly major source for changes in land use and land cover, and they are major users of energy, natural resources and food, but they offer a unique set of opportunities to advance the creation of new conceptual framework for research. Especially an integrative approach of the physical, social and ecological aspects of urban growth on one hand and urban planning and land management on the other hand is missing so far. Interdisciplinary and multidisciplinary perspectives will improve a better understanding of the process of urbanisation and megacities and their governance. Bundesamt für Bauwesen und Raumordnung (1999): Urban Future. Preparatory expertises (Overviews) for the Word Report on Urban Future for the Global Conference on the Urban Future URBAN 21, Bonn. Hall, Peter; Pfeiffer, Ulrich (2001): URBAN 21. Der Expertenbericht zur Zukunft der Städte. Stuttgart, München. Konrad-Adenauer-Stiftung (2003): Megacities III, Handlungsmodelle und strategische Lösungen. Kongress 24.-26.11.2003, Wesseling. Magel, Holger; Wehrmann, Babette (2001): Applying Good Governance to Urban Land Management – Why and How? – In: Zeitschrift für Vermessungswesen, Heft 6/2001. Toepfer, Klaus (2003): Zukunftsbeständige Stadt- und Regionalentwicklung: Leitmotiv für die Problembewältigung der Megacities. Vortrag im Rahmen des Kongresses „Megacities III, Handlungsmodelle und strategische Lösungen“ in Wesseling.